WordPress is currently the most popular CMS (Content Management System), used by 30.4% of all websites, up from 13.1% seven years ago. The wide range of plugins you can use for nearly everything contributes to its popularity. One of the most famous is Yoast SEO, which helps you optimise your website so it can rank better on search engines like Google, Bing, Yahoo and Yandex. 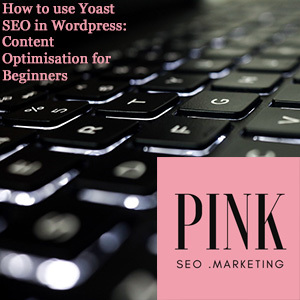 Today we want to help the beginner users understand how to use Yoast SEO in WordPress, for content optimisation DIY. (For a whole on-page SEO checklist, check out this free guide). Even though Yoast has a premium version, the free one is a very good start for any beginners. Yoast SEO has several configurations that need to be set up. While this may worry some beginners with limited tech knowledge, it’s a very common situation, so don’t worry! In this case, the Yoast SEO configuration wizard is of great help. Once you’ve opened it, it will guide you through the steps via a few questions. The right settings for your website will be based specifically on your answers. Once the Wizard has configured the Yoast SEO, it is time to start using it on your website’s content. For every post and page of your website, you will have to strategically choose the best keyword to target. This is no easy choice, and possibly the most important you can make. By performing a professional Keyword Search we can help you find the ones with the best ratio between the highest average monthly volume of search and the lowest competition. Once you’ve chosen your focus keyword, place it in the “Focus keyword” field. Now, write your content, with your keyword in mind. Make sure your content includes your keyword in a very natural way. Your text shouldn’t sound artificial or “keyword-stuffed”. 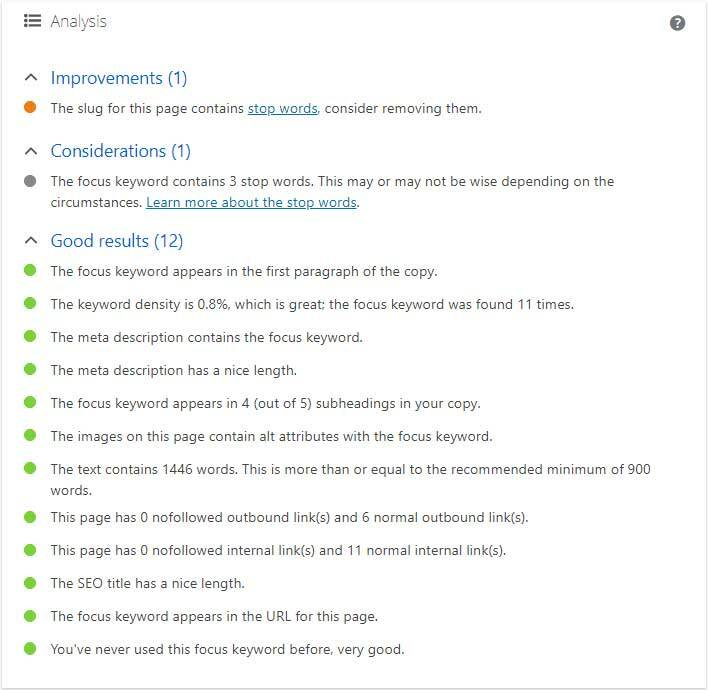 Check this article for some SEO copywriting best practices on how to balance SEO and good copy to avoid sacrificing your content for keyword stuffing. Remember the quote that was (wrongly?) attributed to Ernest Hemingway “Write drunk, edit sober“. We don’t really suggest you writing drunk but do find a way to let words flow out of your mind in a natural and relaxed way. Imagine you’re talking about these topics. If writing feels difficult to you, in our SEO training sessions we suggest you try voice typing to help you “break the ice” with blogging. Then, check the page the following day or a few days later, with a fresh pair of eyes (and hopefully, an unbiased opinion). If at al possible, ask for feedback. Is the content clear, jargon-free, and intuitive enough? Make sure you use your keyword or keyphrase in the subheadings or subtitles. Think of your article or page as if it were a book. To find out what it is about, you usually check its title and subtitles, then the content, but only if you found them of interest. People will read the article if they find the subheadings interesting. Evidence-Based User Experience Research proved that we don’t actually read a page, we scan it. We only actually read if the “scanning” process was interesting enough. Google bots check subheadings to understand what that page is about, too. So start writing your main ideas in the subheadings and fill them with content. The Slug (which is what will appear after the slash in your website’s URL). the Meta Description (check this article to get to learn how to write a good meta description that increases your ranking). Make sure you include the focus keyword in all three. The content analysis is a collection of content checks that analyse the content of your page. It displays a visual checklist appearing as red or green points showing you whether those checks have failed or passed. If the focus keyword appears in the first paragraph of the copy, you will see a green dot. Otherwise, you’ll be advised to make sure the topic is clear immediately. The keyword density is no longer a rigid rule. With RankBrain, Google can detect if your page or post is relevant to that keyword or keyphrase even if it is not an exact match and its density is different. You should never overstuff it, and the suggested value is to be considered as a guideline. The meta description should always be specified, unique, within the correct length, and it should contain the focus keyword. 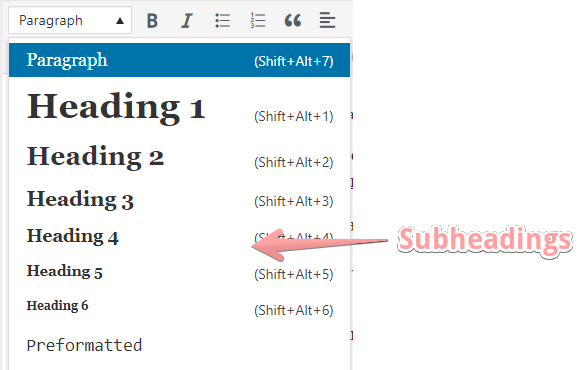 The focus keyword appears in the subheadings (such as an H2) in your copy. The images on this page have alt attributes containing the focus keyword. (Check this article to understand what it is and for more image SEO tips). This page has outbound and internal link(s). (Check this article to understand what is an Anchor Text and which are the best for your backlinks). The focus keyword appears in the SEO title and this has a nice length. It also appears in the URL for this page and has a nice length. If the slug for this page is a bit too long, Yoast SEO will suggest you shorten it. If you decide to rename the URL be sure to check the old URL 301 redirects to the new one! A good and easy plugin for this is Redirection. It is the most popular redirect manager for WordPress. It will help you reduce errors and improve your site ranking. If you never used this focus keyword before, you’ll see a green dot. Otherwise, it will be flagged red, as a problem in the Yoast SEO Content Analysis. It will advise you change the keyword to avoid an internal cannibalisation. I know this image might sound horrible, but it is effective to remember how dangerous this could be! You already have so many competitors in the shape of third-party websites, that you don’t really want to compete with your own internal pages, too! There are so many synonyms you can choose from, so make use of them. They will give you different chances to intercept the user intent, leading to this page of yours! Every page and post should target a different keyword, in a univocal correspondence. Yoast SEO might suggest that, as a potential improvement, you remove “stop words“. Consider, once again, what delivers the best experience for your user. If a stop word is necessary, pleasant to read, and makes perfect sense if used, keep it. Otherwise, try removing and check your content again. 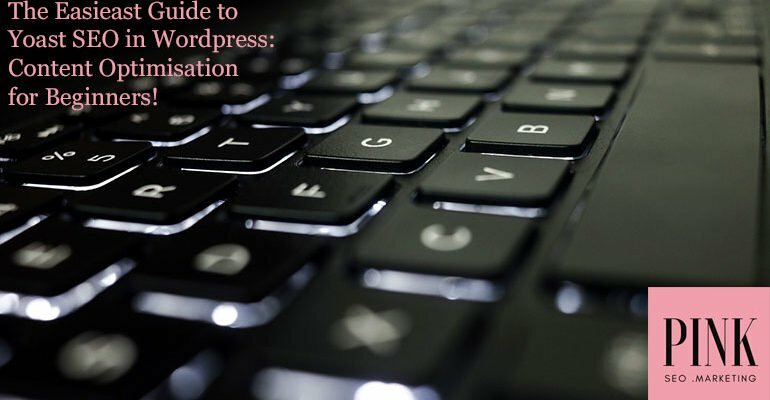 The plugin will inform you of how many words your copy is made of. Creating interesting content, which provides enough information to your users, is the aim of your page. Yoast will recommend a minimum of 300 words. Try to add more content that is relevant to the topic if you wrote fewer words. Personally, we tend to recommend nearly twice as many, considering how competitive the web is nowadays. Most competitors’ pages probably have longer, more relevant pages. These can outrank your content. Aim for 500-600 words at least. If you don’t consider this page to be “cornerstone content” (your most important ones), Yoast suggests a minimum of 900 words. Once again, we recommend exceeding this word count if you do so in a natural, very engaging, and useful way! Some common errors you could come across while learning how to use Yoast SEO in WordPress. “You’re linking to another page with the focus keyword you want this page to rank for. Consider changing that if you truly want this page to rank.”The word you select to link one page to another is called Anchor Text. It basically tells Google: “Check this page, it is about X”. Using an anchor text to Page B with a keyword we would like to rank Page A for would be a mistake. Google would not be able to understand if it is Page B or Page A that should be ranking for that particular page. Check this article for more information on how to check the best anchor text. “The images on this page do not have alt attributes containing the focus keyword.”To add alt attribute in an image, select it in the Media Library and add it as shown in the screenshot on this article about Image SEO. “The focus keyword does not appear in the URL for this page. If you decide to rename the URL be sure to check the old URL 301 redirects to the new one!” Google crawler bots are programmed to check what a page is about in some key places. These are the Title, Meta description, Image alt, content copy, and URL. So, your selected keyword should be present here. Having said that, you need to pay attention to something If you change the URL, you might break a link and create a 404 “Page not found” error. For this reason, you need to make sure you have installed a Redirection plugin and set it up so that it automatically notices 404 errors and redirects them to the new URL you choose. In this second article, we are explaining how to use Yoast SEO in WordPress, specifically: the “Readability” test for beginners. You will learn what they are, why they exist, and how to get all those dots green, too. Now try and optimise the content of (at least) the most important pages and posts of your site! Then, if you are curious to start tracking how they improve their ranking on Google as a result, our affordable Membership Plans are what you need. We will also provide you with SEO Training, Keyword Search, Site Audits, https super fast SEO hosting, and much more! 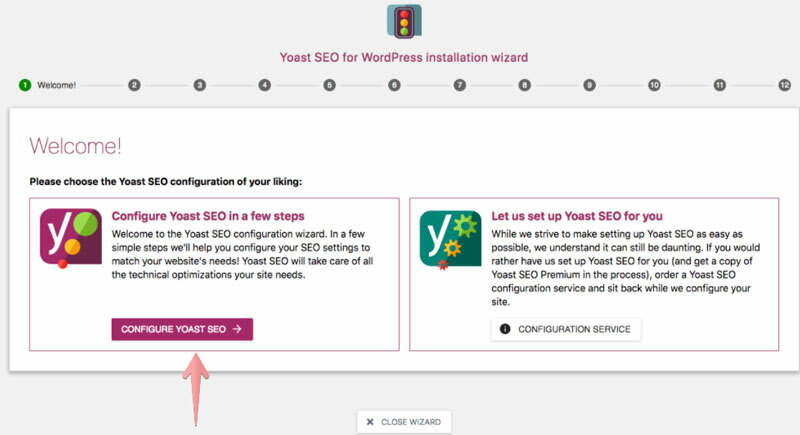 We hope this guide helped you understand how to use Yoast SEO in WordPress. If you have any doubts, please let us know. Comment on the article, on our social media or directly contact us. Your questions will be helpful for other users, too! Wordpress is currently the most popular CMS, used by 30.4% of all websites. 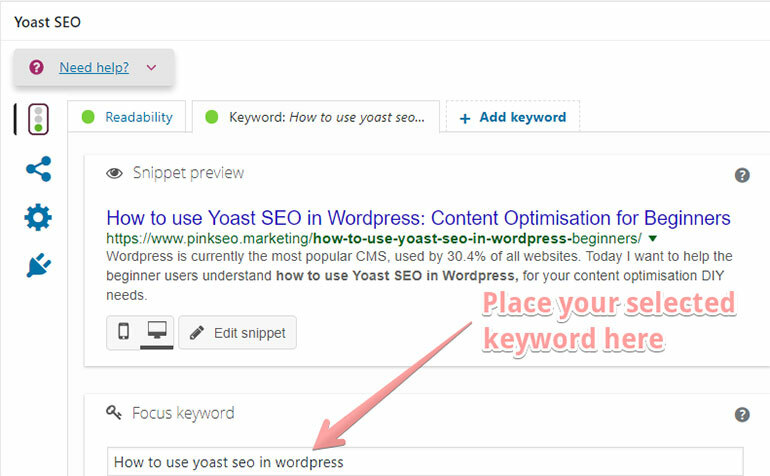 Today, we want to help the beginner users with the easiest guide how to use Yoast SEO in Wordpress, for your content optimisation DIY needs.